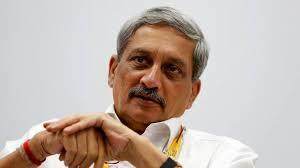 A Goa-based activist on Friday threatened to go on a fast unto death if ailing Chief Minister Manohar Parrikar did not resign and hand over the reins of the state administration to a “physically fit” successor. “Goa needs a fully fit Chief Minister who can dedicate his time and resources to find solutions to problems confronting the state. If Parrikar, who has been ill for a long time now, does not hand over charge by November 16, I along with my colleagues from other NGOs will sit on a fast unto death,” Rajan Ghate, the Right To Information (RTI) activist said in a press conference here. The conference was also addressed by members of the Goa Citizen’s Action Forum (GCAF) and representatives of another state-based NGO Nari Adhikar. “I am giving the BJP-led Goa government a notice of seven days’ time to announce a solution to the issues like rising unemployment, loss of jobs, spread of gambling and casino culture and the failure of Parrikar to allocate important portfolios like Home, Finance, Industries,” Ghate said. He returned from New Delhi’s All India Institute of Medical Sciences on October 14 and has not moved out of his private residence, for any official event since. He has however chaired meetings with top bureaucrats, party officials and local industrialists over the last few days.